EPA researchers developed a pipe loop pilot system that community drinking water utilities can implement locally to study lead-containing scales on pipes taken from area homes. Washington, D.C. — Lead is one of the most pressing challenges communities face in protecting public health in the face of aging water infrastructure. Clear and without taste or odor when dissolved, lead in drinking water poses major health risks, especially for growing families. Ingestion by small children can cause permanent brain damage, resulting in lower intelligence and medical problems for the rest of their lives. U.S. Environmental Protection Agency (EPA) researchers Michael Schock and Darren Lytle are leading research to better understand the science of water chemistry, treatment, and infrastructure to help water system managers and local communities prevent lead from getting into drinking water. Their water chemistry research over the past three decades has revolutionized the understanding of the factors that govern how lead leaches out of existing water pipes and into the drinking water where it can reach people. Schock and Lytle led a team of researchers to study lead pipes recovered from homes across the country. Like a surgeon using an endoscope to peer into an artery to witness its condition, they could see and measure lead-containing scales that form inside a pipe over time. What they discovered was a major breakthrough: The long-established models that water utilities were using to predict how water chemistry changes would prevent corrosion and the release of lead were not matching real world conditions. This new understanding has resulted in better guidance on how to manage drinking water quality to avoid lead release from pipes. Schock and Lytle also led the development of a pipe loop pilot system that community drinking water utilities can implement locally to study lead-containing scales on pipes taken from area homes. 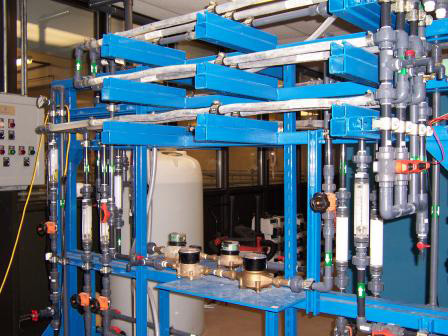 The pipe loop pilot system is a small-scale distribution system simulation that allows for different concentrations and combinations of treatment chemicals to be injected and assessed to determine the most protective effect. Community drinking water utilities subject them to varying chemical treatments, allowing operators to identify optimum water quality and treatment conditions specific to the local community to prevent lead release and safeguard public health. Through their outreach and technical support, Schock and Lytle have directly assisted Flint and dozens of other community utilities develop corrosion control strategies to prevent exposure to lead and other contaminants. Their innovative water chemistry and lead release research has led to countless other communities’ and utilities’ improved knowledge and application. In 2018, through EPA’s public webinars for utilities and operators and its annual small systems workshop, they shared their research with well over 8,000 individuals around the world. Whether it’s advancing the understanding of water chemistry and treatment, investigating the inner workings of underground pipes, or tackling the daunting task of locating lead service lines, EPA research is providing support and answers to help local communities meet the challenges of aging water infrastructure and the risks of lead contamination.